There are seven cervical vertebrae in the region of neck and when degenerative changes start taking place in these vertebrae it results in pain and stiffness of the neck and the condition is known as cervical spondylosis. There is stiffness of neck and pain may extend to other parts of the body as well such as pain may extend in the hands, to the back and even to the legs. There is great discomfort in walking straight and person is not able to balance the gait. There is great difficulty in carrying out the daily activities. Patient with cervical spondylosis also have vertigo that aggravates with standing for a long time or while driving a vehicle continuously. In conventional system, there is no cervical spondylosis treatment. There is no specific cause for cervical spondylosis. It mainly occurs due to degenerative changes in the bones. It may occur at any age. The most important symptom of cervical spondylosis is pain and stiffness of the neck. A person is unable to move head due to stiffness of the neck. There is difficulty in lying down as the pain may extend downwards to the back. It is also difficult to stand or walk for longer periods of time because of the neck pain. Headache and vertigo is present in people suffering from cervical spondylosis. There is difficulty in walking for long distances as it aggravates the symptoms. A person may also complain of numbness and tingling in the fingers. Cervical spondylosis is caused by wear and tear in the bones of the neck. It may also be caused by abnormal growths on the bones of cervical vertebrae. These changes may cause compression of one or more nerves in the neck. People who sit for long times and work on computers or who remain active may have this problem. Obesity is the main factor and if a person avoids physical activity or exercise, it increases the risk further. People who are involved in jobs where a lot of bending and twisting is done or heavy lifting is done. Any spinal surgery can also increase the risk of cervical spondylosis. Another cause is slipped disk. Osteoporosis is a common cause that may cause fracture of the spinal bones. Divya Ekangaveer Rasa: This is an excellent remedy to get relief for back pain. It gives immediate relief from stiffness of the neck. It also enhances the strength of the nerves and muscles in the spine. Divya Pravala Pisti: This is also a natural and herbal remedy for cervical spondylosis treatment. It also gives relief from back pain. It reduces the numbness and tingling of the fingers and also prevents recurrent episodes of vertigo. Divya Brihad vat Chintamani Ras: It is one of the best herbal remedies for back pain. 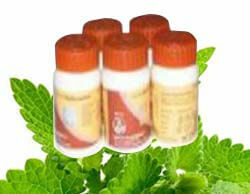 It may be taken along with other herbal remedies in the package to get relief from cervical spondylosis. It is a safe natural remedy for back pain. Divya Swarna Maksika bhasm: This natural remedy provides nutrition to the spine and boosts up the immune system. It provides quick relief from stiffness and pain in the back. Divya Trayodashang Guggulu: This may be taken along with other herbal remedies. It is a wonderful natural treatment for cervical spondylosis. It strengthens the nerves and tissues of the neck and prevents wear and tear. Divya Chanderprabha vati: This herbal remedy for may be taken regularly to get rid of vertigo and numbness of the fingers. It gives nutrition to the bones and prevents early osteoporosis. It may be taken regularly to prevent the symptoms of cervical spondylosis. Try to reduce weight by increasing physical activity. One should do yoga exercises to prevent degeneration of the bones. Exercise keeps you active and should be done under the supervision of an expert guidance. Eat healthy diet and avoid eating processed food. Avoid eating fried foods as this can increase your weight. Try to eat more fruits and vegetables to boost up your immune system. Eat foods that contain calcium because after certain age, bones start losing calcium that reduces the strength of bones. When bones become weak, they become susceptible to injury. Do not work on computer for longer hours. Take rest or move your neck from time to time to avoid stiffness and pain. Sit in a proper posture. Do not use a heavy pillow while sleeping. It can affect your bones and can increase pain. Take a very light weight pillow that is soft and flexible. You may do neck exercises after consulting your doctor. Neck exercises provide quick relief from pain and stiffness. Avoid going on long drives or wear seat belt and neck collar properly to prevent pain and stiffness in the back and neck. If you are suffering from back pain, sleep on a hard bed. It will keep the muscles and bones straight and prevent back pain. Massage your neck and back using sesame oil. Do the massage slowly as it helps in increasing the circulation of the blood to your back and neck. Sesame oil also increases the strength of the muscles and nerves in the back.